Pallas Kunaiyi-Akpanah puts a shot back up. The senior forward was dominant in the first round of the WNIT. When renowned Chicago Bulls commentator Stacey King described star point guard Derrick Rose as “Too Big, Too Strong, Too Fast, Too Good,” he had the otherworldly performances of the 2011 NBA MVP in mind. But he might as well have been describing Northwestern’s dismantling of Dayton in its first-round WNIT matchup, a game in which the Wildcats (17-14, 9-9 Big Ten) thoroughly outmatched their Atlantic 10 opponent with their size, speed and athleticism. NU forced 16 turnovers and held the Flyers (17-14, 10-6 Atlantic 10) to just 17 points in the first half to notch its first postseason win outside of the Big Ten Tournament since 2014. To put the 74-51 rout in perspective, outside of Dayton’s star player Jayla Scaife — who finished with 24 points — the rest of the visiting team combined to shoot a ghastly 9-for-41 from the floor, or 22 percent. The Cats frequently flooded passing lanes and picked off sloppy throws, while they also stole the ball from unsuspecting ballhandlers. Sophomore guard Lindsey Pulliam and senior center Pallas Kunaiyi-Akpanah led the way for the Cats in scoring, notching 26 and 17 points respectively. 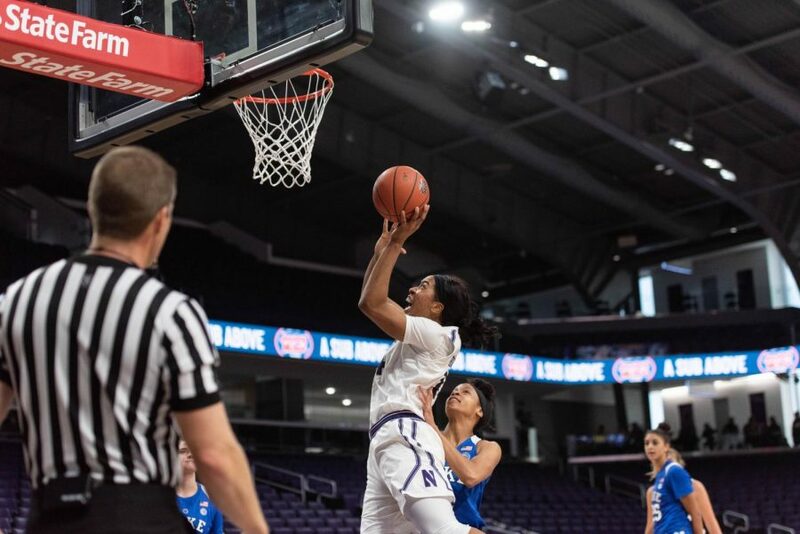 In the blowout, every NU player except redshirt freshman guard Lauryn Satterwhite saw game action, and 10 different players recorded a basket. Kunaiyi-Akpanah also put some fantastic help defense on display in the third quarter, elevating and swatting Dayton guard Jenna Giacone’s shot into the stands with authority. The athletic senior feasted on a middling Dayton offense all game, grabbing 11 boards to go along with five swipes and three blocks. McKeown said he doesn’t think there’s anyone else in college basketball who shares Kunaiyi-Akpanah’s same tenacity for challenging every rebound. Dayton coach Shauna Green, who was an assistant coach at Northwestern for the 2015-16 season, worked with Kunaiyi-Akpanah during her freshman season and thought her improvement since then has been “unbelievable.” She said in the Abuja, Nigeria native’s first workout, the coaching staff had to teach her how to do layups. Three years later, Green believes Kunaiyi-Akpanah has developed into a “special player,” able to come from out of nowhere to block open shots. The Cats play their next game Sunday against Toledo (21-11, 11-7 MAC) in the Round of 32. The Rockets were a middle-of-the-pack team in the MAC, and have only two players who averaged double-digit scoring on the season. Pulliam, coming off a skillful scoring performance in her first nonconference postseason game, is never short on confidence. “I’m going to go do it again on Sunday afternoon,” Pulliam said.